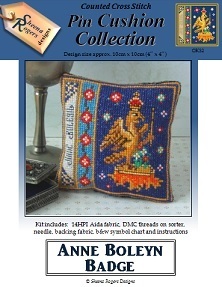 This pincushion design features the Badge of Anne Boleyn, the second wife of King Henry VIII. The emblem shows a crowned Falcon holding a sceptre (representing justice and royal authority), standing on a tree stump (representing regrowth and re-birth) which is sprouting with red and white roses (signifying Tudor offspring). The design also includes a border of Tudor roses set against a deep Turquoise background, with Anne Boleyn's name down the left hand edge, all framed with rich gold and sapphire blue threads. Design size approx: 10cm (4") square. Only whole cross stitch is required, along with some backstitching for the finer details.